Cracked Laptop Screen? No Image? Bring your laptop to Mac PC NY! Same day repair! 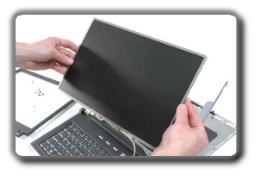 Laptop Screen Replacement NYC specializes in repair and replacement of laptop screens. The three most common failures for a laptop screen are the inverter, the backlight, or the screen itself. If you are getting no video, intermittent video, faded or dim video on the display, it is possible that you need a laptop screen replacement NYC service. Laptop screens are physically damaged very often. The damage includes spills in to the screen or damage to the screen’s circuitry, cracks, tears. As laptops got thinner and lighter weight and the screens have become a lot less firm, so about 3-5 pounds of pressure can break a laptop screen. Tearing on the picture of the screen, distorted areas or black spots are common symptoms of physical damage. Spills may show as stains on the screen, no video at all or flickering picture. Laptop screens may give out from wear and tear over time. This is common on the older screens that used a fluorescent backlight and inverter. The backlight and the inverter are prone to failure from exhausting their useful life. Backlights and inverters tend to experience problems within their first 3-5 years. If inverter is failing the screen flickers and then go dark. When a backlight fails, the warning sign is a pinkish or orange discoloration of the picture that worsens until the screen goes dark. Most screen problems can be fixed by replacing the screen itself, but other issues, such as a bad inverter, defective cable, motherboard fuse or video chipset can be less straightforward. If your laptop experiences on of the issues described, give us a call or come to our office for a free estimate. One of our technicians will take the laptop apart, to find the root of the problem. We offer laptop screen replacement and repair in Manhattan NYC, Brooklyn for most of the computer brands: Dell, Toshiba, Acer, Gateway, Apple, Lenovo, Samsung, Mac, IBM, Compaq, HP.